The Lungta Triptych, 2009, Three images each at 6 x 6 feet. L-R: Manjushri-Wisdom, Avalokiteshvara-Compassion, Vajrapani-Action. Acrylic, sacral Himalayan clay, iron and 23K gold on French linen. 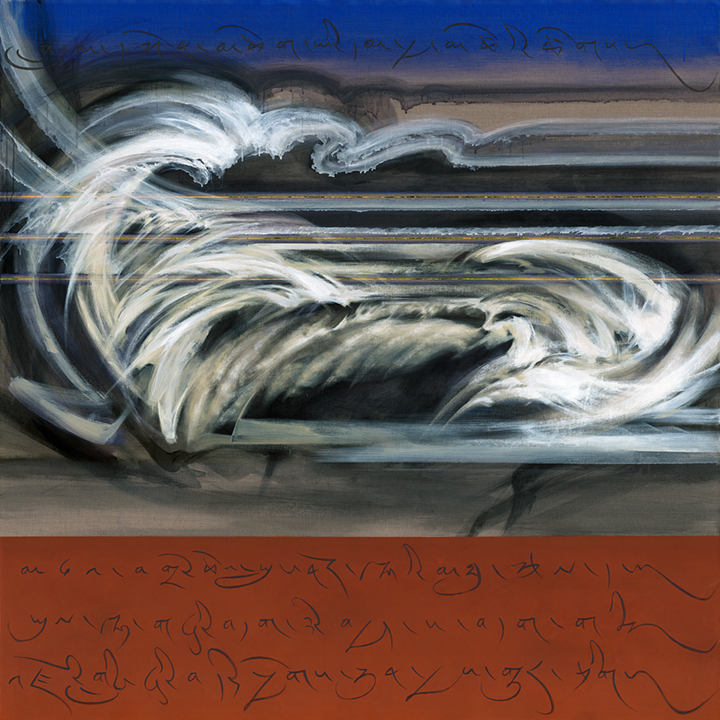 The Lungta Triptych is the visual component of the interdisciplinary Lungta Collaborative, commissioned in 2008 by Philadelphia’s Network for New Music and director Dr. Linda Reichert for NNM’s 2008 season, MIX. Lungta-The Windhorse—is a collaboration of visual art, music, and dance—premiered to standing room only at the University of the Arts in Philadelphia on March 6th, 2009, and at the University of Chicago’s Rockefeller Chapel in 2012. Lungta draws its imagery and inspiration from the remote Buddhist kingdom of Lo in the Nepalese Himalayas, one of the last remaining enclaves of pure Tibetan culture; one which continues to experience the accelerating pressures of climate change and cultural fragmentation. The imagery of Lungta evokes the Buddhist Trinity of Wisdom, Compassion and Action that supports the enlightened Mind, Spirit and Body; the three large canvases hang freely in homage to the prayer flags of Tibetan Buddhism. Whirling clouds represent The Windhorse (Lung/wind-Ta/horse), which carries prayers heavenward. Coursing through the three images are gold threads representing the Life Force or prana. The three color fields are composed of sacral clays of the region, the colors of which signify the Three Protectors, or Rigsum Gompo, of the kingdom of Lo; these colors annoint buildings and structures of spiritual significance--Manjushri-Wisdom (red), Avalokiteshvara-Compassion (white), Vajrapani-Action (blue-black). A Prayer for Planetary Peace composed for this work by the kingdom’s senior monk of the Choede Monastery, Tenzin Sangbo Bista, is transcribed in iron paint upon the three paintings. In researching materials for this collaborative, international Philadelphia-based composer Andrea Clearfield, and visual artist Maureen Drdak, traveled to the remote Tibetan mountain kingdom of Lo in Nepal near the Tibetan border in the late summer of 2008. Read about The Lungta Collaborative here. The documentation of The Lungta Collaborative was presented to His Holiness the Dalai Lama by Dr. Amy Heller through the auspices of the Office of Tibet, (Geneva, Switzerland) during his 2009 visit to Switzerland. Listen to an excerpt of Lungta-The Windhorse here. Composer Andrea Clearfield records the songs of Tashi Tsering, the last Royal Court singer to the King and Queen of Lo Monthang, for The Lungta Collaborative, 2008. L-R: Dr. Sienna Craig with daughter Aida, Jigme Palbar Bista, Raja (king) of the kingdom of Lo, visual artist Maureen Drdak and composer Dr. Andrea Clearfield in the Raja's public audience room, 2008. The ancient fortresses of the Rani (queen) and Raja (king) of Lo Monthang, Upper Mustang, nepal, 2008. Dr. Sienna Craig, Aida and maureen drdak approach the Loba village of Ghemi in Ghemi prefecture, Lo, Upper Mustang, Nepal, 2008. A Loba monk in a medicinal plant field, Lo Monthang, 2008. Network for New Music east coast premiere of "Lungta" at the Great Hall, UArts, Philadelphia, 2009. Philadelphia performance of "Lungta" at Painted Bride, Philadelphia, 2009. Midwest premiere of "Lungta" at Rockefeller Chapel, University of Chicago, 2012.